Water is arguably the most critical and least understood of the foundation elements in brewing beer. 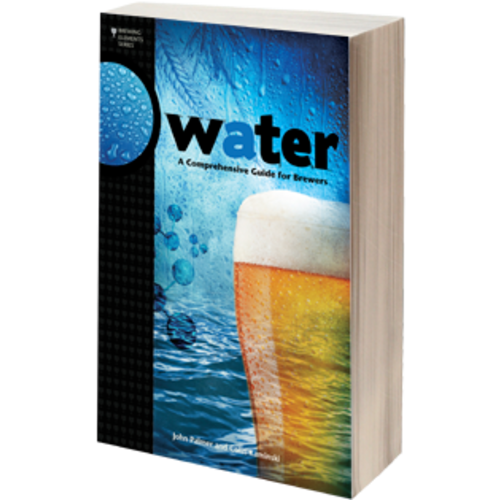 Water: A Comprehensive Guide for Brewers, third in Brewers Publications’ Brewing Elements series, takes the mystery out of water’s role in the brewing process. From an overview on sources, quality and geography, the book leads brewers through how to read water reports, understanding flavor contributions, and the treatment and chemistry of brewing water. A discussion of adjusting water to styles of beer, residual alkalinity, malt acidity, mash pH, brewery process water and wastewater treatment is included. This book really opens your eyes to how important H2O is to the brewing process. I'd reccomend to anyone honestly; Amazing how many minerals can be found that impact the flavor profile when making beer. Extremely helpful for the advanced brewer who wants to learn more. Water is the least understood and most used ingredient in brewing. This book breaks it down for the homebrewer and the probrewer (of which I am both). Answered all of my questions, had super technical chemistry but also concise explanations if you are not a chemistry major, and has a table that outlines water profiles for every style which is invaluable. Can't say enough good stuff about this book. Lots of technical stuff, which isn't bad, but dosen't really get useful until chapter 5. This the first comprehensive book on water analysis when brewing (for serious brewers only) that is readable even for those of us without a chemistry degree. Prior to this publication, I had to search videos and every brewing book for the little information I could find on water chemistry when brewing. Some sections you have to push through but don't let that deter you. The information like, Table 18 and 19, is indispensable when adjusting your water for the beer style you are brewing. With this book and a water calculator spreadsheet (available on line), you should be ready to go to the next level in brewing. Thanks to John Palmer and Collin Kaminski for an excellent reference book.